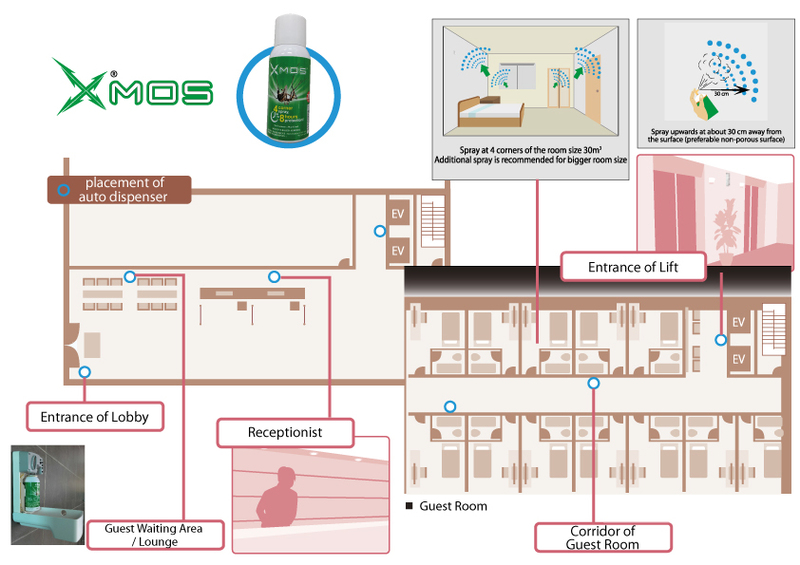 Another innovative High-Tech active ingredient developed by Sumitomo Chemical, Japan. Using metered valve spray - each push delivers same quantity amount of anti-mosquito agent. The nano & slow-release technology will deliver the micro-particle into the air, providing 8 hours “Mosquito Free” protection. With just 4 pushes, the micro particles will spread around the room. Dispersal of the product may even reach inaccessible areas, such as under the bed or table. 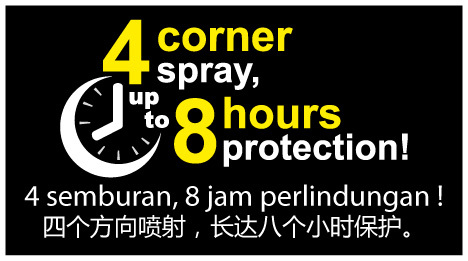 The micro-particle technology that allows the anti-mosquito agent to last for 8 hours. It is effective in killing mosquitoes entering the room even after several hours of application. For X’MOS, metofluthrin (SumiOne®) migrates to the surface of the particle and releases over a period of 8 hours. It slowly releases the nano molecules into the air. 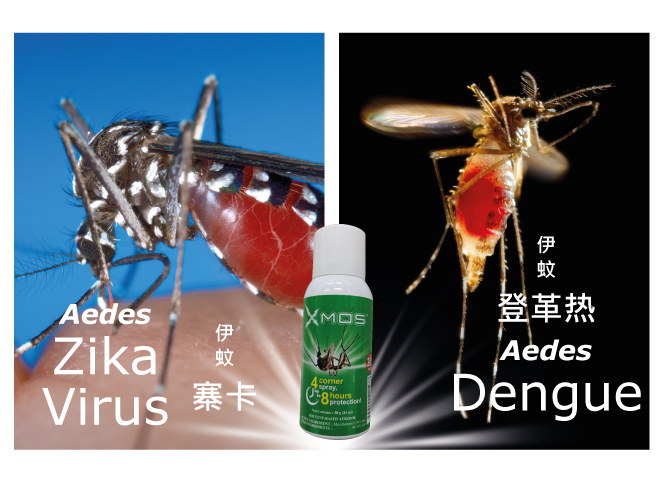 This enables X’MOS to guarantee insecticidal performance for 8 hours. The concentration of insecticide will slowly decline after 5th hour onwards. 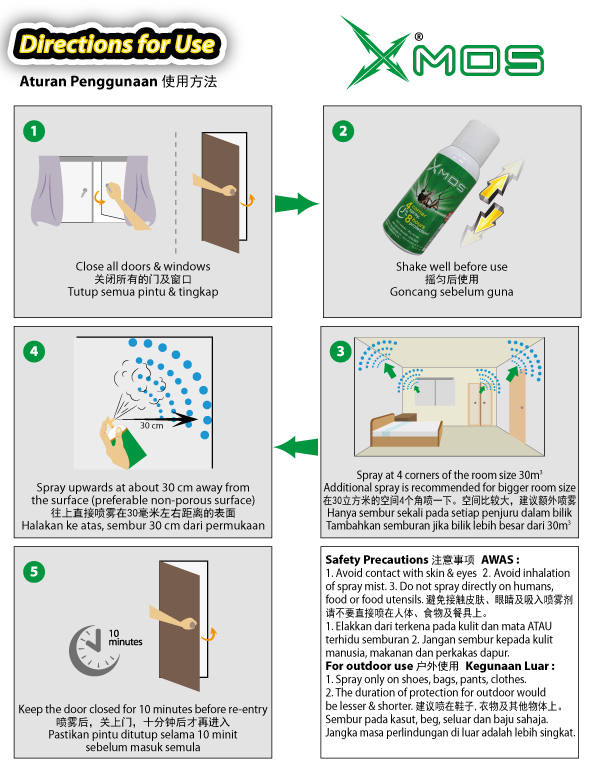 What is the difference between the mechanism of action of X’MOS vs Conventional Aerosol Mosquito Repellents (CAMR)? 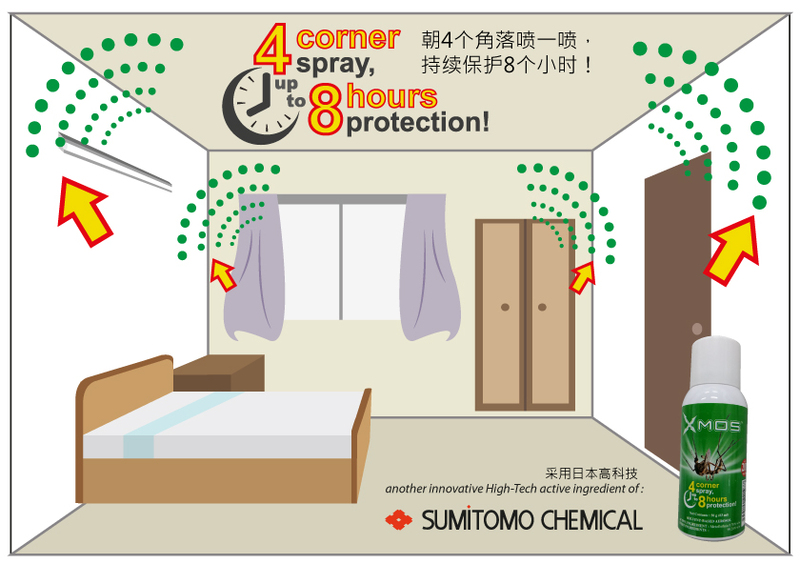 In X’MOS, the evaporative spread pattern of the anti-mosquito agent disperses throughout the room to kill mosquitoes. In CAMR, the anti-mosquito agent falls onto the ground following spraying due to its inability to evaporate effectively, thus settling on floor surfaces.CAMR kills mosquitoes as long as the agent is in the air, therefore requiring a great amount of dosage and gas pressure. What is the difference between the active agent of X’MOS and that of regular CAMR? 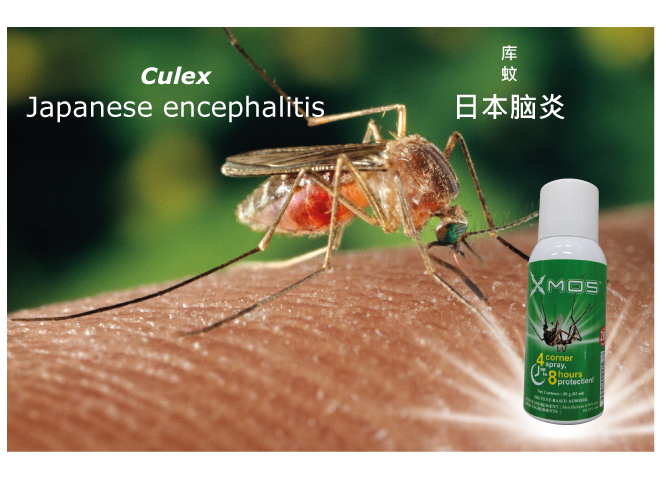 The anti-mosquito agent of X’MOS (Metofluthrin) and CAMR (prallethrin & permethrin) are classified as synthetic pyrethroids, inspired from natural insecticides contained in chrysanthemum flowers. However, the active agent metofluthrin in X’MOS has much higher vapor pressure so that it evaporates more easily in the air and does not leave any residue. 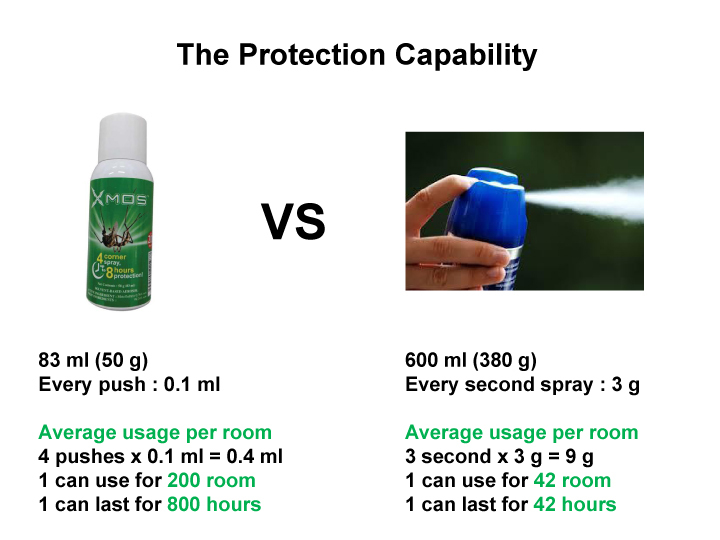 Why is the volume of X’MOS only 83 ml, whereas other aerosol repellents may reach 600 ml? With 83 ml, X’MOS may be used up to 830 pushes of usage. 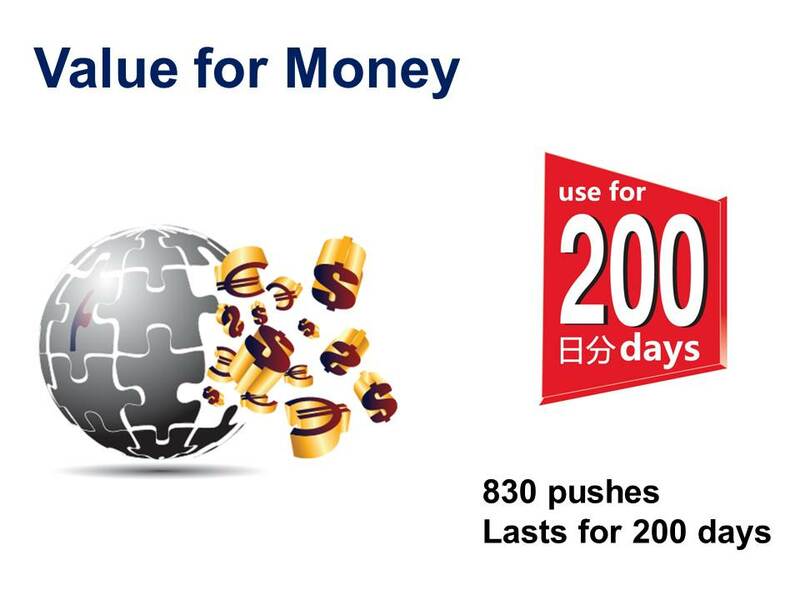 With 4 pushes daily, it can lasts for 200 days. 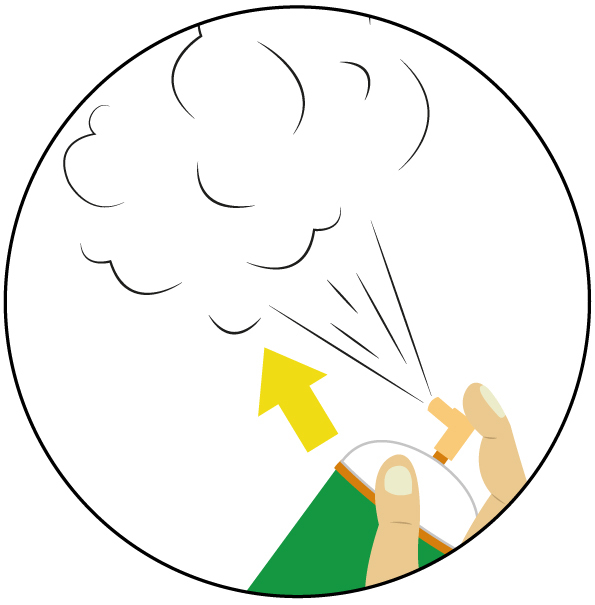 As the active agent can evaporate automatically, it optimally spreads out in the air without falling to the ground,thus no large volume is necessary. For CAMR, the average 3 s spray it expected to lasts for 42 hours. In comparison, XMOS can lasts for 800 hours. The product, like all pesticides, should not be applied directly to the skin. If accidental contact occurs, no significant effects is likely to occur apart from a possible slight tingling (paraesthesia). Metofluthrin is has low acute and chronic toxicity. There are no special concerns for children or infants, however it is always a good practice to minimise exposure of infants to any pest control products. Exposure to high levels of metofluthrin in animal studies was not associated with any significant reproductive or developmental toxicity, so there are no special concerns for pregnant women. However, it is always a good practice to minimise exposure to pesticides for pregnant women. Metofluthrin is unlikely to cause significant effects to animals.